Place the chopped onions in the bottom of a slow cooker. Place the pork shoulder on top of the onions and add garlic, ground mustard, cayenne pepper, brown sugar, salt, pepper, apple cider vinegar, and Worcestershire sauce. Pour Dr. Pepper on top and cook on high for 4 – 5 hours (or low for 8 hours). Very carefully, remove it from the slow cooker and place on a large cutting board. Shred the pork and remove excess fat using forks. Place the shredded pork back into the slow cooker and continue to cook for an additional hour. Drain the remaining juices and toss the meat mixture in the BBQ sauce, adding a little at a time until the desired consistency. For crostini: Preheat oven to 375 degrees F. Brush baguette slices on both sides with Lone Star Olive Ranch Garlic Infused Olive oil and season lightly with fajita seasoning. Arrange on a baking sheet and bake until crusty and brown, approximately 10 to 12 minutes. Turn once about halfway through cooking, and dust with Pecorino-Romano cheese blend. Caramelize onions by sautéing sliced onions in butter and then adding a little brown sugar. 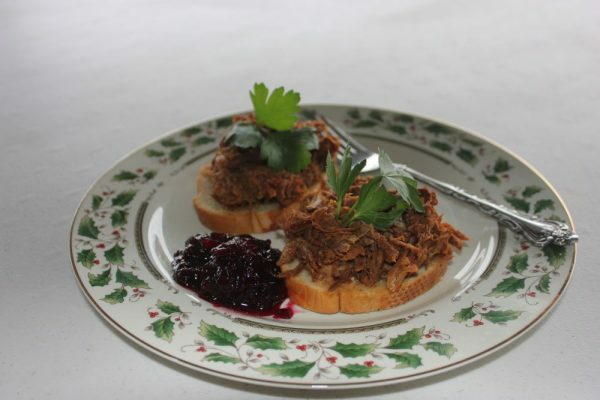 Serve pulled pork on a crostini and top with caramelized onions; enjoy!